In the thick of it depicts an alternate landscape modeled from the detritus and debris of the urban environment. Both consumer waste items and naturally formed found objects are replicated in alternate materials imbuing them with an uncanny quality; both familiar yet strange. This playfully eerie and unsettling installation, makes art objects out of the trash and fragments, investing the discards with importance as signifiers of our time – precious artifacts modeled from our urban world. Part museum exhibit, part fall out zone, the viewer is invited to gaze upon a landscape that could be anywhere and here. IMAGES | Melanie Upton, Coagulate, 2013| Images courtesy of the artist. Walking down a narrow back lane near my home I catalogue the rubbish I encounter. Blue plastic glove. Tissue. BWS receipt. It’s thinly scattered at first, but becomes dense the deeper into the lane I get. Vitamin Water bottle. Energizer battery pack (torn). 3 x VB bottles. 4 x cigarette packs. Cardboard. Baby wipe. Calippo tube. Pepsi can (flattened). 3.5” floppy disk (broken). Packing tape. Cigarette butts. Hot chips carton. Straw (McDonald’s). Pizza box. Plastic bag. 1 x Uno card. Coat hanger (size 12). Plastic cup (broken, splayed out like a flower). Cherry Ripe wrapper (twin pack). McDonald's cup (large). Metal cap off a champagne bottle (flattened). Branch from a fake Christmas tree. Straw (7-Eleven). Soon there is too much to list, and I give up. Near the end of the lane there’s a vacant lot. Until Melanie brought me here a week ago, I didn’t know it existed, but it has seemingly been sitting here, disused, for years. Along a neighbouring wall, piles of rubble jut out like little peninsulas. Thick, gnarly weeds line the property edges, while smaller ones pop up through cracks in the concrete. Further in, a large man-made hole, about three metres in diameter, has filled with water, becoming an unlikely pond. Rubble and rubbish form sloping banks around its edge, while planks of wood—presumably old floorboards—float on the surface like driftwood and renegade plants emerge from its murky depths. Liberated from functional use and left to decay, this space has developed into a unique urban ecosystem, where building ruins and urban detritus have morphed with elements of nature, creating a new post-industrial landscape. Elementally, it is reminiscent of pop culture visions of Armageddon, yet it lacks the menace; it’s less war zone, more…nature park. Despite first impressions, there is a distinct existence of life here. Standing in the space, the light breeze creating ripples across the pond’s oil-slicked surface, I feel a sense of strange calm and slight bewilderment. I could imagine picnicking by that pond. Melanie tells me how the vacant lot has subtly evolved over time: the rubble gradually being rearranged, new graffiti superseding old, couches and mattresses appearing and disappearing, rubbish deteriorating into the earth only to be replaced with more. This shifting landscape plays out in my imagination like a time-lapse sequence in a nature documentary. While largely removed from traditional concepts of nature, there’s a life cycle here. Melanie says she has been visiting the vacant lot for months, exploring, observing and scavenging. Rubbish and the discarded object have long been a motif in her work, fuelled by an interest in urban debris and the fallout of mass consumption. Casting found items of discarded packaging in coloured resins or precious metals, she creates permanent monuments from the disposable; fetishising them as objects of beauty beyond their function. Stepping away from the sites of her earlier works—stairwells and alleyways, where constant rubbish removal renders the existence of litter more fleeting—Melanie has started looking at those spaces where, through lack of intervention, rubbish is left to sit for days, months, years. Here, as in the case of the vacant lot, rubbish takes on a whole new life. Left to slowly rot, it becomes enmeshed with its environment, morphing and mutating as it travels the long journey of decay. First the shine disappears, then colours on labels start to fade. Embedded with rubble or caked in mud, the junk takes on a new, organic form, barely recognisable as the consumer item it started out as. It is at this point in the process of ruin that Melanie removes these objects and, casting them in aluminium, freezes their evolution in time, creating what she has termed ‘contemporary fossils’. Displayed amongst rubble reminiscent of where they were found, these sculptural works narrate earthly journeys of transition: decay, ruin and degeneration. This is further reflected in Melanie’s collage works. 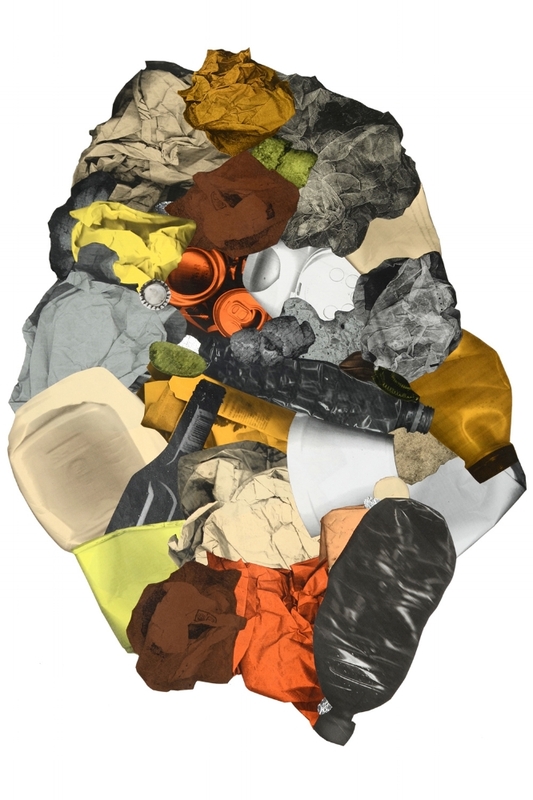 Using a photocopier, pieces of rubbish and rubble are similarly cast in time, their labels removed and forms distorted so they become largely unidentifiable. Massed together, they appear as giant, geomorphic nuggets; totems of the increasing subsumption of waste into the modern landscape. Seen as a kind of time capsule, In the thick of it reflects the conditions of our current environment, where consumption and waste are constants and urban detritus has become so perfectly fused with the natural landscape it’s hard to distinguish between the two. Perhaps, Melanie questions, this is a distinction future generations will no longer be able to make. I contemplate the pond. Camouflaged against the brown water, a beer bottle floats, caked in mud. And strangely, it seems kind of…right.